My Grandfather was a Freemason. He was originaly from Rhodesia & died in South Africa in 1975. I recently received his possessons after my mother passed away; included was a Masonic pin. I would love to know its meaning & symbolism. I know very little about him. He was a blacksmith by trade. His name was Thomas A Hodgkinson. The 2 columns represent the 2 columns which stood at the front of King Solomon's Temple, which was located in Jerusalem about 3,000 years ago. Today, the only remains that are believed to still be standing is a lower retaining wall, known as the "Wailing Wall". If you Google this, you can find a video camera which takes pictures of this holy wall on a 24-7 basis. It is considered sacred and since it was unearthed, people from around the world go there to pray. At top center is a Blazing Star, which represents the Heavens, and Deity which watches over each of us. From your photo, it looks as if the center of the star had a jewel in it at one time. Typically, this would be a diamond, but it may also have contained a different stone. Below the Blazing Star is the Holy Book which symbolizes the holy book of one's own faith. For Christians, this would be the Bible; for Muslims, the Que'ran; for Jews, the Torah, etc. Below the Holy Book is a point surrounded by 2 vertical lines. This represents the symbol, the Point Within The Circle. While on your Masonic Pin, there is no visible circle, this symbol represents a person (the "dot" in the center) and the vertical line on the left, John the Baptist and the vertical line on the right, John the Evangelist,...2 holy men within the scriptures. 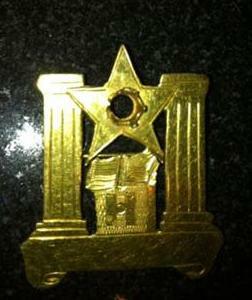 This Masonic pin was probably handmade using a mold. Thank you for sharing this with everyone! I'm sure your Grandfather wore this pin with great pride. As a Freemason, your grandfather was a moral man who believed in God, (the Supreme Architect of the Universe), and who believed in the brotherhood of man. I hope this is helpful to you, Thomas.